Maldah was an important trading centre and a place of great wealth and prosperity during medieval times. A foreign settlement since 1680, Maldah was known as English Bazar (Ingraj Bazar) when the Dutch, French and the East India Company established trade here. Though Ingraj Bazar is the district headquarters, the nearby city of Gaur (16 km) contains most of the culturally and historically important places. Gaur came into prominence under the reign of Sasanka, and was the capital of ancient Bengal for several centuries. The city saw three eras of glory – the Buddhist Palas, Hindu Senas and the Muslim Nawabs. During the Pala and Sena dynasties, Gaur flourished as a centre of learning, art and culture. The existing relics are mostly Muslim monuments dating back to 14th and 15th centuries, Maldah district is also famous for its mangoes, silk farm, and low lying marshes which offer ample scope for bird watchers. Rail: The best way to visit heritage sites is by undertaking an overnight journey by Gaur Express from Kolkata to Maldah. Road: National Highway 34 cuts across Maldah district providing a vital link with other parts of the State. Baroduari: Also known as Bara Sona Masjid, the great golden mosque was built in 1526 by Sultan Nusrat Shah. A gigantic rectangular structure of brick, this mosque is the largest monument in Gaur. Beels: A number of low lying marshy tracts known as ‘Beels’ can be found in this district. Here, a variety of wild fowl including the Siberian goose can be seen during the season. Best season to visit is November to February. Chika Moaque: Chika mosque is a single dome edifice almost in ruins. The images of Hindu idols on the stonework of doors and lintels are still partly visible. Dakhil Darwaza: The main gateways to the fort, its four corners are topped with five-storied high towers. Gaur & Pandua in Maldah: The heritage sites in these historical remains of the medieval capitals of Bengal comprise in Bara Sona Mosque, Dakhil Darwaza, Qadam Rusul Mosque, Lattan Mosque, Gumti Gate, Firoz Minar, Adina Mosque and Eklakhi Mausoleum. 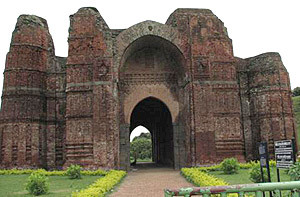 Paundua contains the third largest concentration of Muslim monuments in Bengal. Notable among these in the Adina Masjid, built in 1369 by Sultan Sikander Shah, One of the largest mosques in India, it also typifies the most developed mosque architecture of the period. The Eklahi Mausoleum is the most elegant monument in Pandua. Also worth seeing are the Bari Dargah and Qutb Shahi Mosque. Lattan Mosque: Also known as Nattan Mosque, legend attributes the building of this mosque to a dancing girl of the royal court. However, historians believe Sultan Yiusuf Shah built it in 1475. Maldah Museum: The museum has a rare collection of stone images, coins and inscriptions retrieved from the ruins of Gaur and Pandua. Baharampur: Baharampur lies 11 km south of Murshidabad. Besides the crumbling mansions and cemeteries of the English and Dutch settlements, it is a centre for raw silk production and weaving. This entry was posted in Malda, West Bengal. Bookmark the permalink.